Bow to the almighty Death Star, you pitiful citizens of Alderaan! 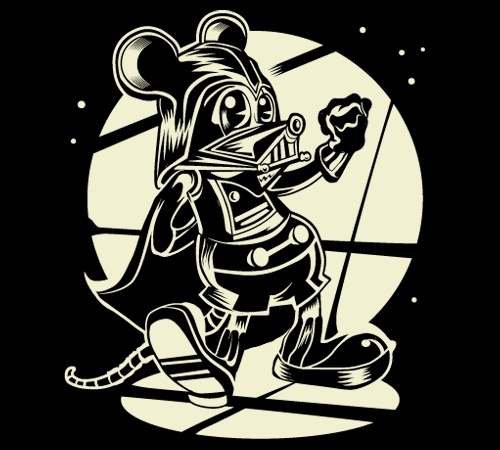 You are at the mercy of Mouse Vader! That's how it feels lately, with the Walt Disney Company going on a shopping spree. They picked up Marvel Entertainment (Guardians of the Galaxy, The Avengers, X-Men, Fantastic Four, Spider-Man, The Incredible Hulk) back in 2009, then Lucasfilm (Star Wars) in 2012, and almost bought Hasbro in 2013. Now they have signed a deal with Canadian broadcaster Corus Entertainment (Corus Ent) to bring The Disney Channel to Canada in 2017. While this means most of the Disney Channel programs that currently air on Family will move there (and that Disney XD Canada and Disney Jr. Canada [English and French] will be re-named Family XTRM and Family Junior, respectively), Canadian furries and cartoon fans can only hope they'll get a maple leaf version of the late Toon Disney and air The Disney Afternoon programs, though they have gotten lucky with Nickelodeon Canada airing a long retro block of Nicktoons in the afternoon, so anything is possible!